Federal Justice Minister, Michael Keenan, has provided a three page response to the CFCV led industry paper pointing out anomalies and issues with the updated National Firearms Agreement. We are grateful for the attention the minister gave to this, as he could just as easily ignored it, but has responded. Unfortunately, the response retains the confusing nature of what “must” means, because to do otherwise would have been an admission of a stuff up. He also seems to imply that shooting organisations were complicit in the drafting of the updated NFA, which is an amazing claim. It’s also untrue. Keenan’s knows he’s got a problem. It may not have been of his making (as we think the bureaucrats stitched him up), but it’s one he’s in no hurry to fix. In the meantime, we continue to pay the price. This issue goes back to Keenan’s management of the National Firearms Agreement review when he proposed it be amended to reclassify lever-action shotguns to the more restrictive categories of B and D.
While he made public commitments that this was the only policy change, the updated version presented to our police ministers earlier this year, proved otherwise. The new version turns previously optional elements from the original NFA, into mandatory elements by saying the jurisdictions “must” impose those requirements. In fact the updated version uses the word “must” 58 times when the previous version (incorporating the 2002 Handgun Agreement) used it 21, which we think came from the bureaucrats working underneath him. The implications of these changes are significant as it would result in banning juniors, the deaf and the disabled from participating in the shooting sports, require the imposition of ammo purchase limits, longer waiting periods for acquiring firearms, tighter storage requirements and so on. Click here to see our previous blog for more background. Regular readers will know that the CFCV led a joint industry submission on the updated NFA which addressed each of the issues, one at a time, in an effort to have those changes reversed (click here to see the submission). This work included a series of meetings including one with Keenan’s office which made the claim that compliance with the NFA was not binding. They said it was up to the jurisdictions to determine if they wanted to implement the NFA, and to what extent. Then we got it in writing. In April this year Keenan wrote to the Firearm Dealers Association – Queensland explaining his position (click here to see that letter). Then, a few days ago, we received his formal response to our submission (click here to see his letter). If you compare the responses, you will see he told the dealers that it is up to the states and territories “whether, and how” they implement the NFA, but changed that to “how” when he wrote to us. He omitted “whether, and” in what was otherwise identical phrasing. “Whether” clearly means someone has an option to do or not do something. The fact that it has been removed from Minister Keenan’s narrative means he can see the problem with the language and trying to reverse the earlier advice to our representatives. In his letter to the CFCV, Minister Keenan also introduced the concept that the NFA is not “legally binding”. That’s true, but the NFA is not, and never was, a legal document. Not even John Howard pretended the NFA was a legal document. However Howard certainly had a different view of what “must” meant as those of you old enough will recall when, in 1996, he threatened the states with financial sanctions if they didn’t implement the NFA. Keenan’s approach seems to be the opposite. Minister Keenan isn’t a dumb guy. He has a Bachelor of Arts (History and Politics), Bachelor of Arts (Honours, Political Science) and Master of Philosophy (International Relations). Anyone with that CV knows what “must” means. The Oxford dictionary defines “must” as “be obliged to”. It uses synonyms (similar words/phrases) of “ought to, should, have to, have got to, need to, be obliged to, be required to, be compelled to, be under an obligation to”. Keenan isn’t confused. He’s trying to avoid having to fix a problem created under his watch. If “must” doesn’t involve some sort of obligation, then have a look at the Federal Government’s Border Force website for advice on what to do when you are bringing firearms into Australia, illicitly or otherwise. If “must” meant you could decide “whether” or not to do something, then declaring firearms at the border would be optional (imagine that!). Of course, it isn’t, and you “must” declare them, but it shows that even his own government thinks ‘must means must’. 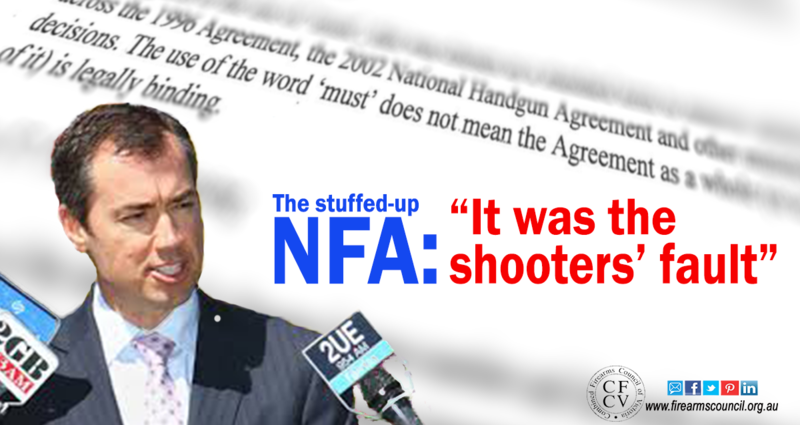 Keenan has lost control of the NFA and has actions have set the scene for confusion the next time it is ‘updated’. The PM needs to step in and fix this mess – which starts with effective consultation. 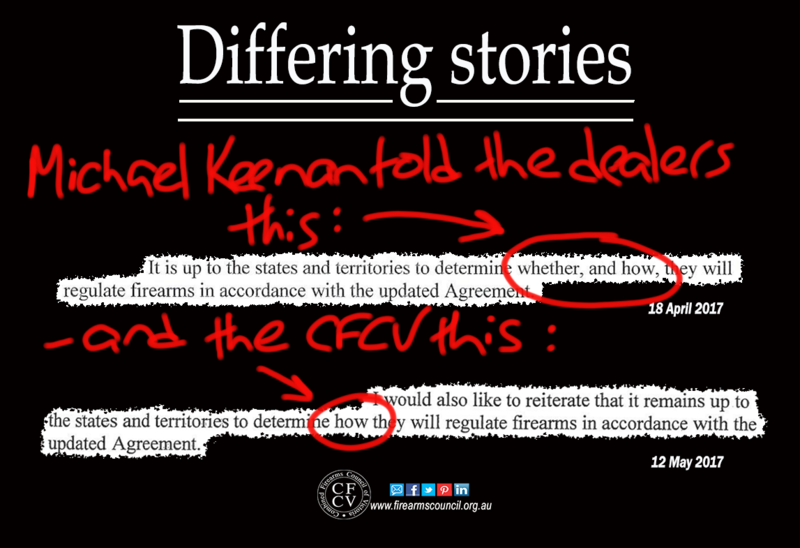 In his response to the CFCV, Minister Keenan noted that he established the FIRG and claims it “discussed proposed amendments to the National Firearms Agreement beyond lever action shotguns”. This suggests that its members – who include organisations you are members of – were somehow complicit in, or aware of, those changes. The Minister’s response is technically correct but I do not believe paints a complete picture of the process by which the NFA review took place. The first and obvious issue was the vague language of the findings of the Martin Place Siege Review and in particular the use of the term “technical elements”. As was pointed out in the many submissions to the NFWPG review no new technologies had been introduced since 1996 that would be a basis for a review. Indeed, the Adler, which sadly become the focus of the subsequent review and discussions, is no different to the Winchester Model 1887 – developed in 1887. While members of the FIRG had meetings with the NFPWG on several occasions, most of those meetings could hardly be described as consultative. While FIRG members had an opportunity to raise issues there was little or no response or acknowledgement from the NFPWG either at those meetings or in subsequent minutes or documentation. The Minister correctly points out that firearms legislation is the responsibility of state and territory governments. This matter was visited on several occasions by members of the FIRG during our recent meetings. We cautioned that, while the Minister may have been undertaking the review with the intention to simplify the NFA, ultimately he and his department would have little or no control over the outcomes. This was subsequently proven to be correct. It is a matter of fact that several states and the Attorney General’s Department took advantage of the opportunity provided by the review to change the meaning and intent of the 1996 agreement in ways that are essentially prejudicial to the interests of many law abiding firearms owners. It is also important to understand that, while the FIRG had a number of meeting with the NFPWG and with the Minister, we were not involved in any meetings with state ministers nor were we given the opportunity to review or discuss the revised agreement prior to its release. This was, in my view, a critical omission in what was supposed to be a consultative process. The final absurdity of the process was AG’s response to FIRG criticism of the “terminology creep” in the revised NFA which saw “should” become “must” and several similar deleterious changes to the original text. Their answer – “don’t worry this agreement is not binding”. That statement, repeated in the penultimate paragraph of the Minister’s letter, serves to underscore the confusion and contradictions around the role of the federal government in firearms legislation in this country. Put simply, while a federal minister may approach this area of legislation with the best of intentions (and I believe this was the case in this instance) the individual states can, will and in this case have done whatever they like. What the process has revealed is a considerable disparity of opinions among the current state governments. There is no doubt that same states and their responsible ministers are far from accepting of the rights of legitimate firearms owners. We must be aware of this and work to educate and change where possible. It is time for the shooting sports to become united and to work together to once again become a political force. Anyone who knows Russell would know he would not say that lightly and would only take that position if our situation was dire. It is. The CFCV was established to run political campaigns, with a lot of successes. If we are to embark on political action 2.0, then it might as well start in the WA electorate of Stirling. That’s Keenan’s seat. It’s marginal which presents an opportunity for us to make the point that the shooting community is not impressed with the Minister’s conduct. If you’re in WA and would like to help out, pls make sure you’re on our email list or follow us on social media – because we’ll be calling on you for help later on. Not in WA? Not to worry! Stirling is just the starting point. We’ll have more voting recommendations for the next election. … but WAIT, there’s MORE …. Blatant attempt to obfuscate and confuse and not present any solid information to rebut. It’s a gutless approach which this government is famous for in many circles. Fact is they play to the electorates who represent the biggest swings as in inner-city seats where the leaders plant their backsides until retirement. These seats are typically Green, trendies who care not for the right to defend their lives and homes as the police are right there all the time. All the left leaning from our pollies stems from trying to maintain these cushy seats. The country seats will never hold as much sway as if the country folk aren’t happy out they go. We need greater representation from the country and need to see a concerted boot every time they muck up. One at a time, out they go, wether they were involved or not. Silence is consent. I think it is about time that the individual Minister, his head bureaucrat,along with his decision making team should be personally pursued through the courts for trying to pervert and or interfere with due process of these talks and be compelled to hand over all copies, notes etc of the minutes of these meetings to all the persons attending these talks in an unedited form within 20 minutes of the meeting closing. the attendese would have a further hour to peruse these documents,before signing the originals. The legal fees are to be covered personally by the persons named in this discustingly diabolical attempt to steamroll the upright and honest citizens of Australia. No third party, Government,poletion or staff and or their family, Union, Organization, Financial Institution etc would be allowed under any perceived circumstances to finance these people in court.